Pavlovsk is located 30km from Saint-Petersburg. It is one of the most popular tourist attractions. The town center, its park and palace ensemble have become the objects of UNESCO Heritage since 1990. Pavlovsk Palace is the center of Pavlovsk town. Its park occupies two thirds of the town territory to the north of the palace. Originally the place was known as Pavlovskoe Village founded in 1777. Pavlovsk – is the summer residence of the family of Paul I. The construction of Pavlovsk Palace began on the high hill not far from Slavyanka river on May 25, 1782. The central building in gold and white colors was made in 1782. Pavlovskoe Village, that is located 5 km from Tsar Village, and 400 hectares of land Grand Duke Paul and his second wife Maria Fyodorovna got as a present from Catherine the Great when their first son was born. Pavlovsk Palace was designed by the Scottish architect Charles Cameron in the 80-ties of the 18th century. It looks like an Italian villa with the flat cupola. The monument to Paul I was made in 1872 in the imperial courtyard – in the center of the square in front of Pavlovsk Palace. 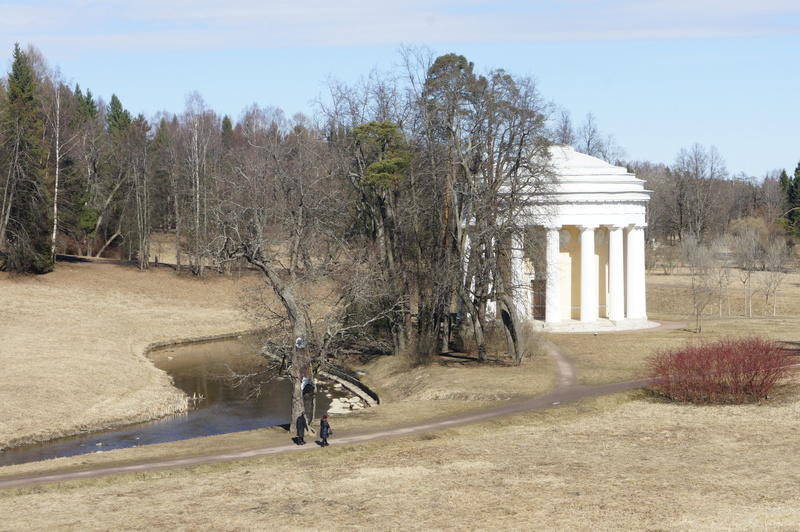 Both Pavlovsk landscape park ensemble and the big palace with the same name were designed in baroque and classical styles. Charles Cameron widely used different materials: carving and gilding, marble and mirrors, silk and grand marble fireplaces, statues and Corinthian columns. Every decoration detail, created by the architect’s imagination and by creators’ skills turned Pavlovsk Palace into a real masterpiece. The round dance of numerous sculptures and paintings, French tapestries with court life scenes and the cupola inside painting and decoration amaze every visitor. Multicolored marble, columns and enormous chandeliers add gracefulness and solemnity to the image of the palace grand halls. The second floor of the palace is Grand halls enfilade. Italian Hall was arranged as a Roman pantheon with a light lantern cupola. The collection of antique sculptures brought from Italy in the 18th century decorates its perimeter. Greek Hall, recognized by the green Corinthian columns and sculptures from Greek mythology, was used for balls and grand receptions. The rooms of the second floor were divided into two wings – the rooms of Paul I and his wife. The third floor is occupied by premises. The main hall of Pavlovsk Palace – Throne Hall with the throne of Paul I – was located in a separate southern pavilion together with Grand Dining Room, Cavalier Hall and St Peter and Paul’s Church. The unique collections of Italian paintings of the 16-19th centuries, antique sculptures, French bronzes, Russian porcelain and glass, Russian and French furniture are kept in Pavlovsk Place nowadays. We are Polina and Maria. We work in St. Petersburg as private guides. We are always ready to arrange for you best St. Petersburg tours to show you the city where we work and live. 15 liniya Vasilyevskogo Ostrova 8/40, Saint-Petersburg, Russia. I give my permission to use my personal information as I got acquainted with Privacy Note of the site.